Sometimes, the best birthday presents are the ones you give yourself. In [Dino]’s case, they’re the ones you make for yourself. 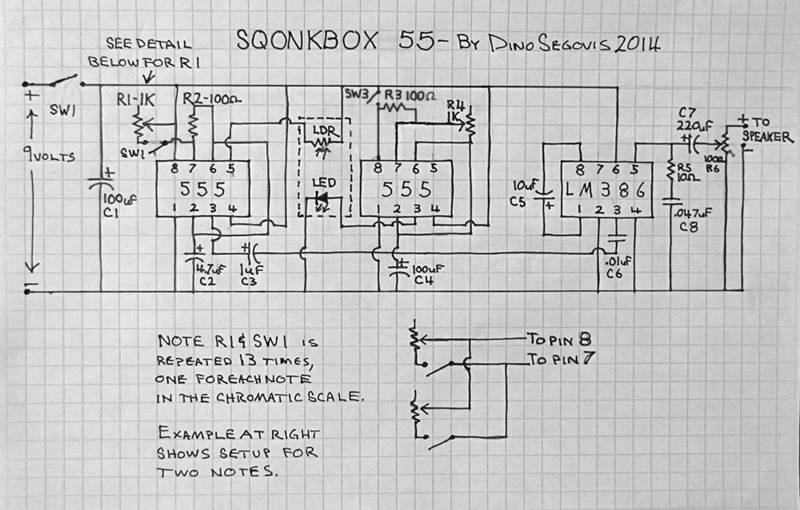 In honor of his 55th, he built the Sqonkbox 55, a 13-note cigar box organ based on a 555 and amplified with an LM386. 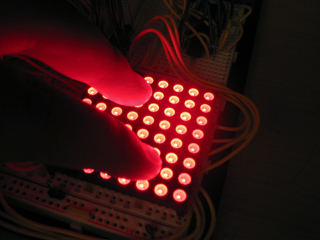 It’s based on a 555 wired in astable mode, turning it into an oscillator that outputs a frequency. This frequency is determined by the resistors between pins 6 and 7, another between 7 and 8, and the capacitor between pin 2 and ground. [Dino] shows a breadboard version first, with a single tuning pot and momentary acting as a piano key. As he explains, this portion of the circuit is repeated 13 times with pots and momentaries that he arranges like piano keys through the lid of a cigar box. If you’ve ever dealt with a brightly lit Christmas tree, you might understand the frustration of having to crawl underneath the tree to turn the lights on and off. [brmarcum] feel’s your pain. He’s developed his own motion activated AC switching circuit to turn the lights on and off automatically. A motion sensor ensures that the lights are only on when there are people around to actually see the lights. The circuit also has an adjustable timer so [brmarcum] can change the length of time that the lights stay on. The project is split into several different pieces. 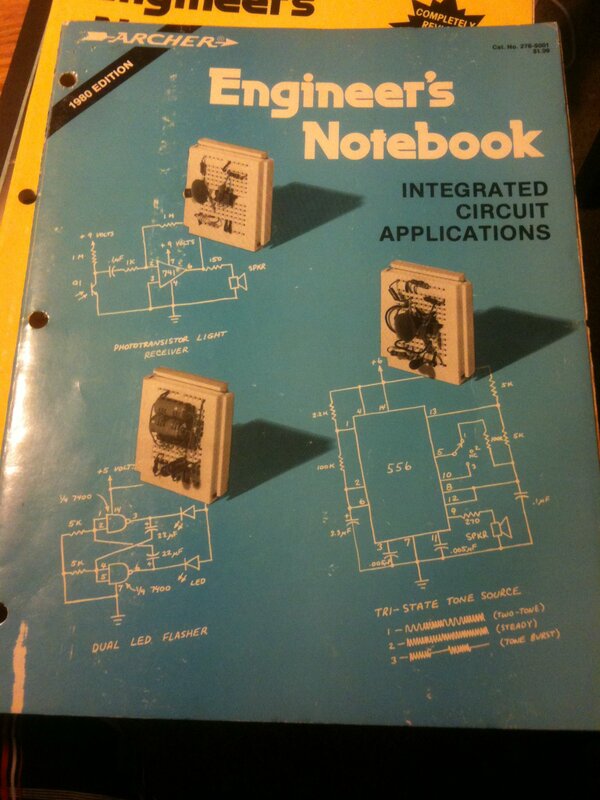 This makes the building and debugging of the circuit easier. The mains power is first run through a transformer to lower the voltage by a factor of 10. What remains is then filtered and regulated to 9VDC. [brmarcum] is using a Parallax PIR sensor which requires 4.5V. Therefore, the 9V signal is then lowered once more using a voltage divider circuit. When the PIR sensor is triggered, it activates the timer circuit. The timer circuit is driven by a 555 timer. The circuit itself was originally borrowed from a classic Forrest Mims book, though it was slightly modified to accommodate the PIR sensor. The original push-button trigger was removed and replaced with the signal from the PIR sensor. The only problem is that the circuit was expecting a low signal as the trigger and the PIR sensor outputs a high signal. [brmarcum] resolved this problem with an NPN BJT to invert the signal. Once the timer is triggered, it flips on a relay that allows the mains electricity to flow through to the lights. [brmarcum] soldered the entire circuit onto a piece of protoboard. The final product was then mounted securely inside of an insulated plastic case. This allows him to mount the circuit safely underneath the Christmas tree skirt. The PIR sensor is kept external to the enclosure and wired up into the tree itself. This allows the sensor to still detect motion in the room while the rest of the circuit is hidden away.